Trying to work out how to get to the Melbourne beach boxes? 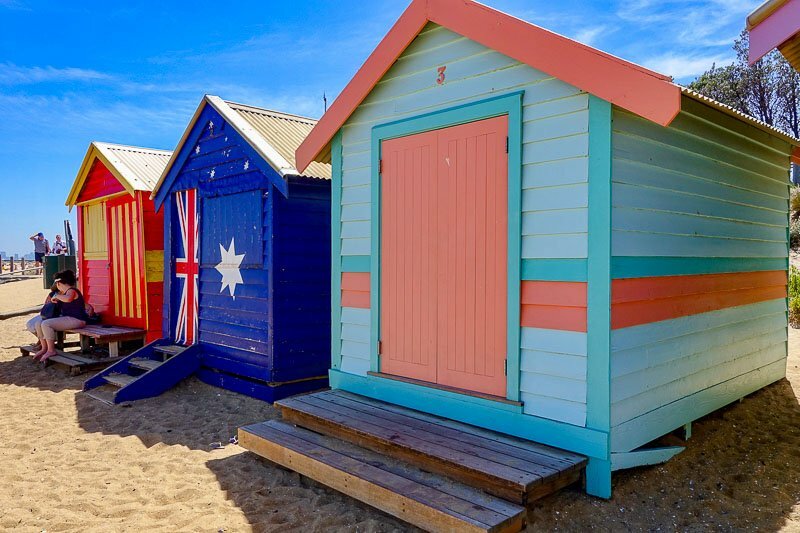 I have been to Melbourne many times over the years, but I had never been down to Brighton Beach to see the iconic Melbourne bathing boxes. 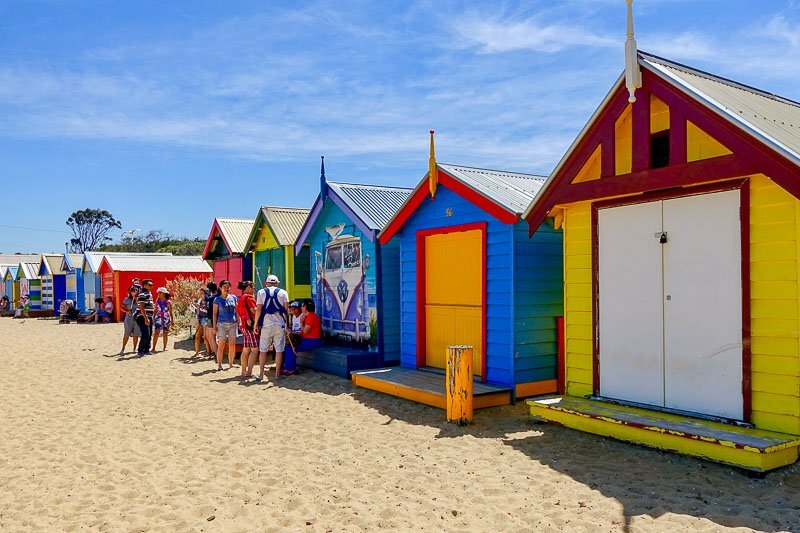 There are 82 of these colourful little huts all lined up on the beach, overlooking Port Phillip Bay. Mostly they are used as storage spaces or change rooms. Some are incredibly well kitted out, others are simply a hut. 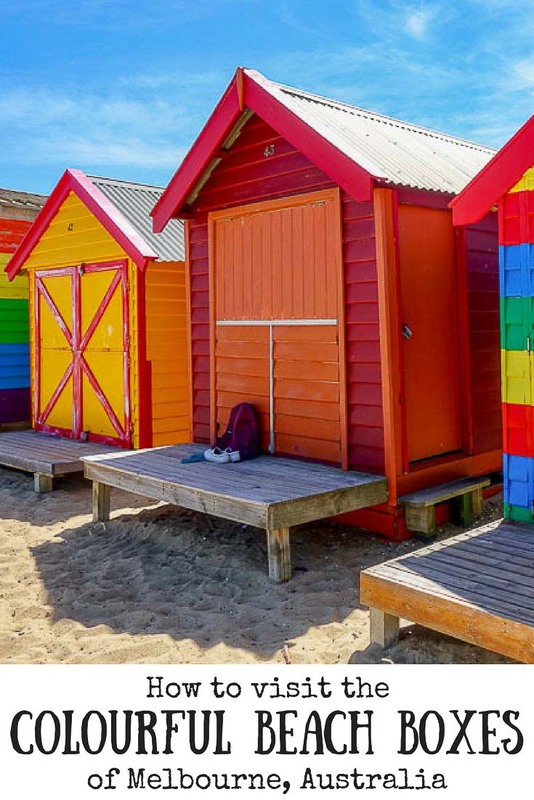 If you wanted to purchase one of these little beach shacks, they can cost as much as buying a small apartment, but you would need luck too – they rarely go on sale. I had a couple of hours to spare on a recent trip so decided it was time to go and have a look at these Melbourne beach boxes for myself. Here’s my experience, and some advice on how to do it better. My preparation before arriving in Melbourne consisted of a quick look at the Public Transport Victoria website. I have used this many times before to plan out a trip in Melbourne using public transport. 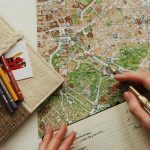 It has a journey planner, so it’s really easy to stick in where you are travelling from and to, and it will give you all the available options and how long each will take. I stuck Brighton Beach into the “To” field, and discovered there was a train straight there, so kept in my mind I needed to get on the Sandringham train. It would take about 30 minutes on the train. Once in Melbourne, we made our way to Flinders Street Station (but could have gone to any of the CBD stations) and waited for the next Sandringham train. While waiting, the notification board above our head scrolled through all the stations the train would stop at. I always take note of the station before the one I need so that I am prepared to get off. There were three Brighton stations – North Brighton, Middle Brighton and Brighton Beach. Clearly I needed to get off at Brighton Beach, because, well, that one was the beach! We get off the train and immediately smell the sea air. We follow the rest of the crowds towards the water. As we cross the road and come to the top of the stairs leading down to the sand we stop dead! There are no beach boxes to be seen in either direction as the beach curves off to the left and the right. Oh boy! This is what happens when I just assume I know where I am going and don’t do any research. 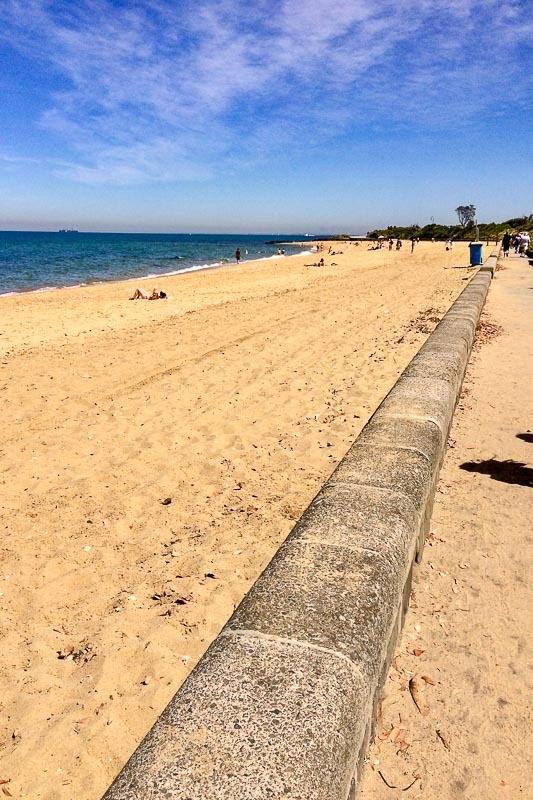 Brighton Beach – but where are the beach boxes? I noticed that most of the crowd turned towards the right, so we also headed in that direction to the end of the beach. We walked up over a headland, and we were about to descend down into the next bay. There in the distance, past yet another headland, were the beach boxes! We now knew we were going in the right direction. There are the beach boxes! And that’s the Melbourne city skyline in the background. Beach boxes! Now, how do I get there? It took us about twenty-five minutes to walk along the beachfront to reach the beach boxes. The day we were there it was sunny but also very windy. There were only a few people on the beach, so no crowds. A lot of people were doing what we were doing, walking along photographing the beach boxes. Many other groups were here just to take photos too. Even one with an Australian flag! The boxes are so bright and colourful and taking this excursion is a great way to spend an hour or two. As it was time to leave, I finally did what I should have done in the first place. I used Google Maps to find the nearest train station. 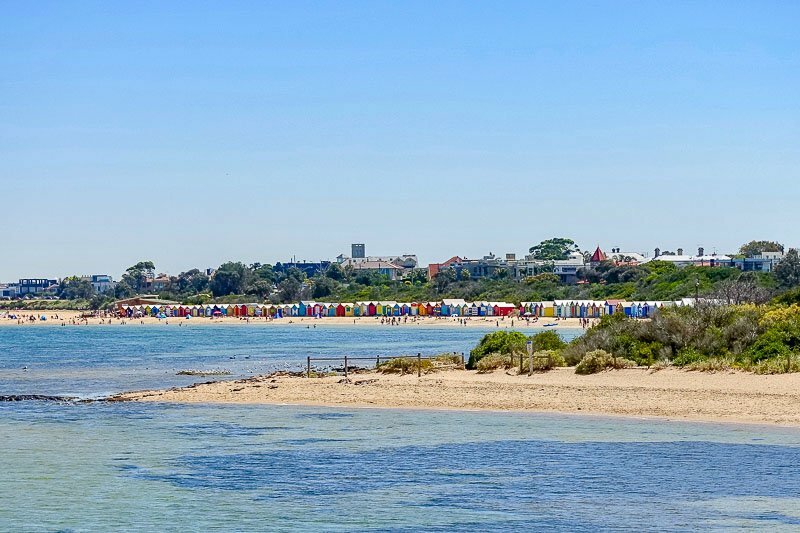 First I learned that while these are referred to as the Brighton beach boxes, that refers to the suburb not the beach, as they actually are on Dendy Street Beach. 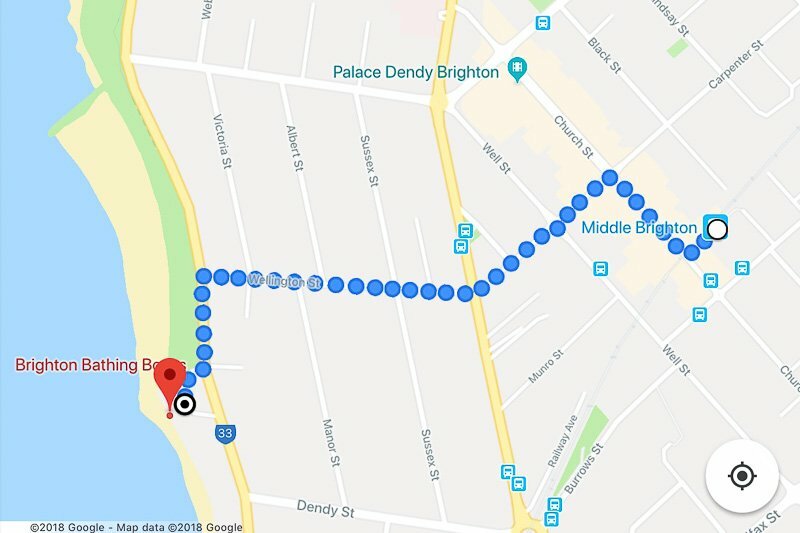 The closest train station, Middle Brighton station, was about 1.2km or a 15 minute walk from the northern end of the beach boxes – much closer than the Brighton Beach station. It’s not a straight walk, and if visiting you will need to have some sort of directions. Either use Google Maps as I have done below, or get directions before you catch the train. Here’s the path between the Beach Huts and Middle Brighton train station. 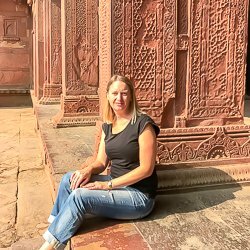 I couldn’t write this without a quick mention of Melbourne’s slightly quirky public transport system. You must buy a myki card to be able to travel on the trains, trams and buses. There is no way to pay cash for a single trip. I bought my myki card when I arrived at the airport at the Skybus ticket office. They offer a $15 (adult) tourist myki card that is pre-loaded with $9 worth of credit and also includes some tourist maps and discount vouchers. You can find out more about myki here. Don’t Want to Catch the Train? The next best option to get to the Melbourne beach boxes is to catch a Taxi or Uber. I personally recommend using an Uber while in Melbourne. UberX from Flinders Street Station in the city centre to the Brighton bathing boxes point on the map above will cost around $31AUD ($23USD/€19). Looking for airport transfers? 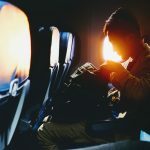 See my post on Melbourne Airport Transfers here. Was so excited to see those beach boxes on a road trip a couple of years ago. Might have to make another trip to Brighton to check them out again. One of those was put on the market a couple of months ago and sold for over 300k. Madness! I had heard they were worth a bit, but that is crazy! I love Melbourne, although I have only been twice. I didn’t know about these, but will definitely check them out on my next visit. Love your colourful photos. There were some really good ones. I just loved the colour contrast and that they are all so bright and well preserved. I hope they stay that way for years to come. These are so cute – I love anything super colourful. I have always wanted to visit the beach boxes. This is a great article on how to reach them by public transport. Thanks Melissa. It’s taken me years to get to see them, even though I have been in Melbourne at least three times a year for the last five years! I am not good in directions. I am thankful that my boyfriend can do those things that I find difficult to deal with. On our recent trip, we haven’t researched much. I wish we did so we enjoyed Macau, the place we visited recently. I have learned the lessons now so I will do all my best for our next trip. Normally I am good with directions, but I think I got too over confident since it was a city I had been to many times before. Whoops! 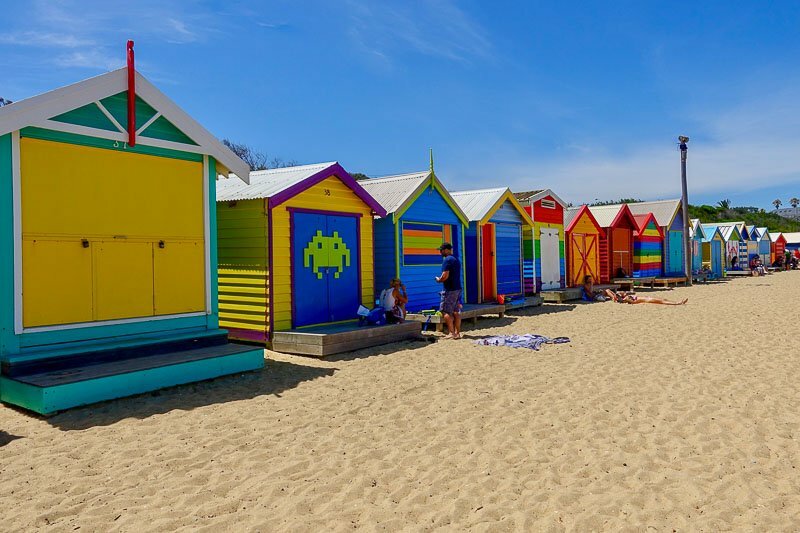 Beautiful – These are similar to the colourful beach huts we have in Cape Town. I’d love to get to Cape Town – it looks so beautiful. I will have to keep these in mind when I eventually get there. Colorful, cute box houses. You gave us an idea—we are planning to have a dog house built for our furry critter. Hehehe! But I wonder what is in side those box houses. They are mostly just storage sheds for all the things you like to bring to the beach – umbrellas, chairs etc. They are also used as change rooms. These look like so much fun to visit! I love the colors. I have yet to travel to Australia, but need to put this down as a place to find. Thanks for sharing. I never even heard of these before. Love it and how colorful they are. Australia is a dream destination for me. I will go someday and I will look for these. Thanks Leiha. I hope you do get to Australia some day. The beach boxes have always intrigued me. I have seen them in a lot of movies and they sure seem stunning! The photographs are so lovely and adorable. I would love to take a picture over there. Thank you. Yes, they are great to photograph. I took so many photos! Those beach boxes are just so photogenic! I love how each one is painted differently showcasing the owners’ personality. Love the vibrancy of these huts. These huts always make me smile! Thanks Catherine! There’s just something about them isn’t there? Thanks Kathi. Aren’t they great? I knew they were in Melbourne, but it has taken me many trips there before I visited! 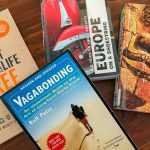 I love Brighton in the UK so it’s fascinating to read about Brighton Australia! I haven’t made a visit yet, but I’m planning to try to get both Aus and NZ this year. Really interesting post with beautiful photos, thanks Josie, and it reminded me of the beach huts (as we call them) in Southwold, UK. Thanks Valerie. Brighton is high on my list for when I get to the UK next. 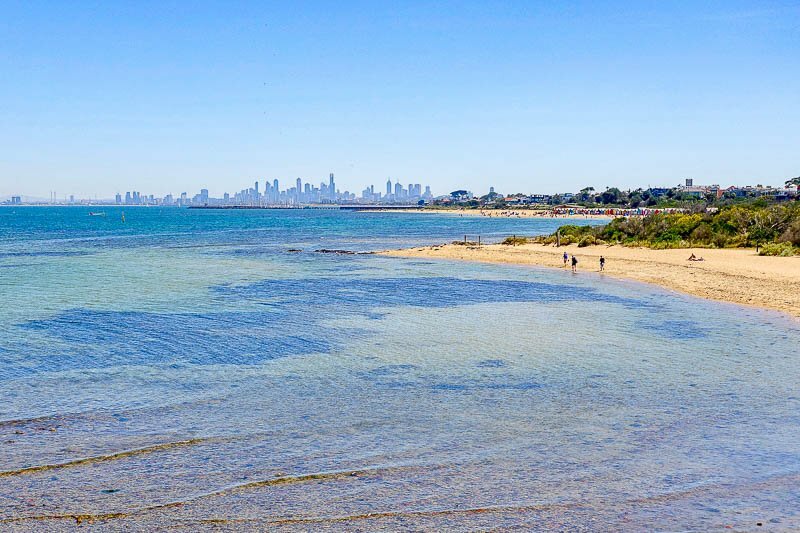 Did you know not only is there a Brighton in Melbourne, but in my hometown of Adelaide we also have a suburb called Brighton, and it’s neighbour is Hove. I can probably guess where the person who named them came from! Never knew of these Beach boxes :).. So colorful and pretty they look!.. I loved the one with the Australian flag! I do hope to come to Australia soon – My cousin stays in Adelaide :).. Thanks Aarti. Adelaide is my hometown! Australia is the #1 item on my bucket list and I am adding this right under it. Those boxes are gorgeous and I love that each one is different. What great photos! Thanks Tracy! Well worth a visit if you are in Melbourne. Don’t forget to pop over to South Australia too – it’s such an under-rated location. Thanks Doryn. Aren’t they so cute? 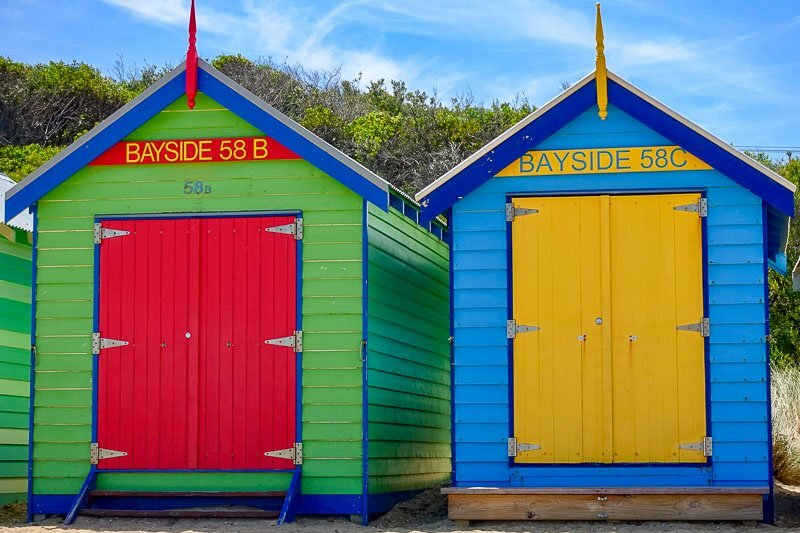 They are individually owned, and are used as change rooms and for storing things like beach umbrellas and chairs, so that the owners don’t have to bring them to the beach every time they visit. They are very exclusive and cost as much as a full sized house another parts of the country as they are no longer allowed to be built. Saving this for later! Great guide. This area is so cute and picturesque! Thanks for sharing! Wow! Hadn’t heard of beach boxes till I read this post. Then ran off to google and found that some of them date as far back as 1862. Amazing! Hopefully I get to see some soon! Thanks Abby. Yes, they have been around for a while. It’s also no longer allowed to build more, so these will stay just like they are! Thank you for sharing this useful guide. I would love to see these cute and colourful beach boxes some day! Love all of the colors! Really great and easy to follow advice on how to get there! Thank you. I hope I can help at least one person not make the same mistake I made. I love beach boxes/ huts, they are so pretty. We get a lot of the in the UK. From what I hear they are really expensive to buy/ rent. Yes. These ones can cost the same amount as a house costs in other parts of Australia. Wow, I didn’t know these existed! Will definitely check them out when I come to Melbourne! Thanks Lisa. They are worth a quick visit. ooh thank you for this easy to follow guide! These are so pretty and I would live to visit sometime!! Cute pictures, I’ve never heard of these before! What are they used for? 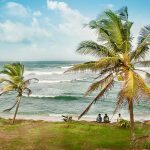 They are used as changing rooms as well as for storage of things like beach umbrellas and chairs, so the owners don’t have to carry them to the beach each time. Thanks Danielle. Yes, I believe there are some similar ones in the UK. Someone over here probably stole the idea from there – just like the name! The boxes are used and changing rooms as well as to store things like beach umbrellas and chairs so they don’t have to be carried to the beach every visit. Love the photos! Helpful description of the quirks of Melbourne’s transportation system. It’s always nice to know what to expect! Thanks Sarah. I’ve always wondered how many visitors go to get on a bus or train in Melbourne and find out they can’t pay! It’s not an ideal system for visitors to the city I don’t think. Excellent tips! 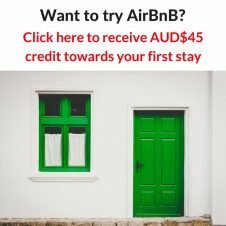 I’m moving to Melbourne in January and definitely want to visit these! These tips will come in handy I’m sure. Cheers! Thanks Caylie. Enjoy Melbourne, it’s one of my favourite cities.